Add this to the list of the many things I once loved that having kids turned into a chore: Jack o’lanterns. Along with holiday decorating (no, wait, don’t hang that so high…damn) and cookie frosting (the icing is all going to come out of the back of that bag…damn) and just about every other finicky crafty tradition I secretly love came the hollowing out and carving of the pumpkins. Every year, I managed to look forward to it. And every year, after an evening of of snatching knives from little hands and scooping the guts from enough half-frozen pumpkins to make our own jack o’lantern soccer team, I regretted the choice not to make just, say, one family pumpkin. One jack o’lantern to rule them all, I could say, and I could carve it at night, in secret, long after bedtime. Heck, maybe the jack o’lantern fairy brought it. And then, as they do, things changed. This year, every member of our family carved his or her very own jack o’lantern. This is not a story of me wistfully gazing back at adorable pictures of small children wrestling with large squash. This is not me telling you to treasure every pumpkin seed your toddler wipes in your hair because these moments, they go so quick. No way. Pumpkins were carved, there were no injuries, seeds were roasted and a good time was had by all. Best of all, I got to carve my own Jack o’lanterns, releasing their inner gourdly ghouls for all the world to see. This is the story of me giving myself a big old rousing pat on the back, and telling you—if you’re not there yet—that this is the goal and it is in sight, I swear. Maybe you are not someone who, like me, considers pumpkin carving to be your only chance to release the artist within. But if it’s not pumpkin carving, it’s something else. We do a lot for our kids, sometimes because we want to, and sometimes because we have to. But with everything—everything—we should be remembering: the idea is that eventually, and sooner rather than later, they be able to do these things for themselves. Cook a simple meal, do a load of laundry, clean a bathroom, carve a pumpkin. Life skills, man. So we start by doing things for them. They describe the pumpkin, we carve. Then we facilitate their efforts—can they draw the face? Scoop some of the guts out? Cut a big wide mouth with our hand over theirs? Then we release the knives and guide only with our voices and—oops—they’ve cut right through what they meant to be jaggedy teeth, but that’s ok. Pumpkins aren’t meant to be perfect. 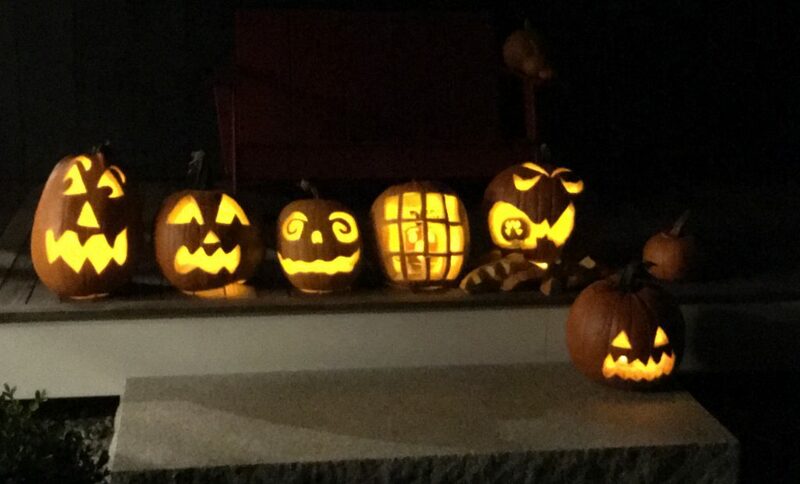 Then, finally, they’ve carved a pumpkin jail cell to enclose a wicked mini pumpkin, and helped a sibling to execute a pumpkin cannibal (because you’ve maybe been facilitating their sense of humor all along, too). I did a big chunk of original research for my book, and one of my favorite findings amounted to this: happier parents of younger children do quite a bit for their kids, but the happiest parents of older children are those who do far less. That’s the trajectory we want to be on. So back off as far as you can this year, and let the pumpkin guts fall where they may. And if you love a good manic pumpkin grin, don’t forget to carve your own.